This is a distant throwback photo of maryann Babangida with Princess Diana of Wales at a banquet in Lagos on March 15th,1990. Late Maryam Babangida died in 2009 while Princess Diana died on August 31st, 1997 after a car crash in Paris, France. 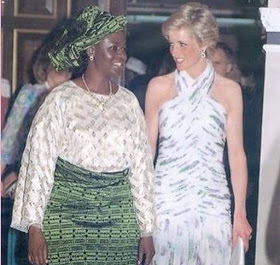 0 Response to "Throwback Photo Of Maryann Babangida And Princess Diana Of Wales In 1990"